The every increasing awareness of difference of culture, of ethnicity, of beliefs and of practices of faith presents an opportunity for multiple lines of inquiry the range and possibilities of which are only today being explored on the cusp. Viewed from the contours, the richness of historic and cultural resources of different religions offer opportunities to further explore, clarify, and present alternative interpretations. Navigating the interiors, these constellations of heritage offer stimulating opportunities to discuss, debate and present cultural comparisons. The various traditions of scholarships have, through the years, not only clashed, protecting and defending their respective places and orbits. But these clashes of traditions have also significantly influenced one another creating other areas and modes of inquiry and giving birth to new disciplines. These friendly encounters are signs of good health that may bring together voices within and outside the religious traditions under one canopy openness. In this light, we would like to invite graduate students, NGOs, faculty, cultural and religious organizations, and independent researchers and scholars to share their research/es concerning religion and diversity. We welcome papers with multidisciplinary bent. Called Canopy Forum this regular activity, a quarter in a year undertaking, can take the shape of roundtable discussion, mini lecture and presentation of full papers or works in progress concerning the over-all theme. This forum will run on an alternate basis as regards hosting and venue. Forged between UST’s Institute of Religion and PUP’s Institute of Cultural Studies, the forum will be held on alternate venues, UST and PUP, and so on. 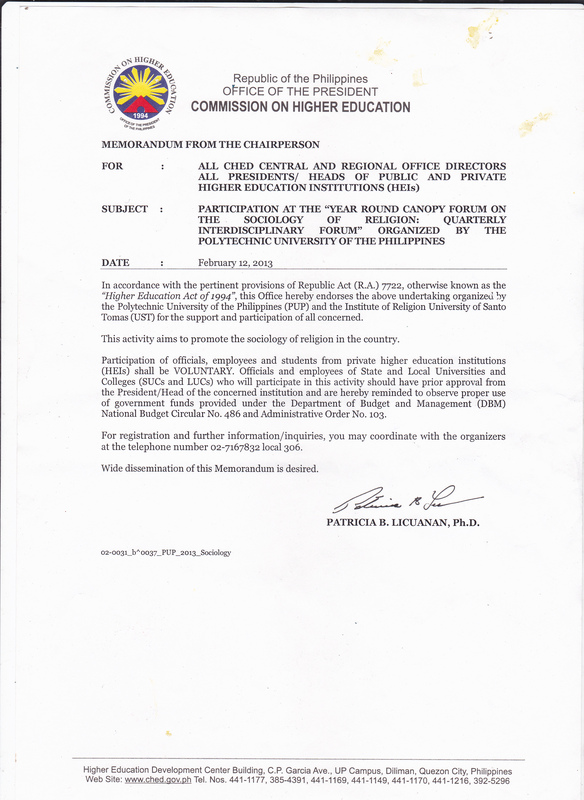 This activity is part of the over-all umbrella effort of the Philippine Association for the Sociology of Religion.